Add even more versatility to your Milton turbo blow gun with this set of OSHA-compliant brass turbo blow gun nozzles. 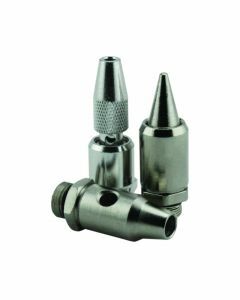 The Milton S-183 nozzle kit trio includes: (1) adjustable nozzle that allows for airflow adjustment and shut-off, (1) high-volume nozzle to increase airflow from the nozzle end, and (1) fan spray nozzle to provide wider airflow pattern delivery. Simply thread desired nozzle onto the end of the Milton S-181 or S-182 turbo blow gun (3/8" NPT).